Many chassis developers have begun to “over-design” their cases. There are, of course, plenty of customers who are attracted to boastful designs that look like jet fighter turbines or even more unique shapes. I believe that majority of computer enthusiasts want a case that has had plenty of thought put into it. Small features that make system builder’s life easier, and manageable interior space that makes for clean build. Newer companies should take example from the more experienced designers in exactly these categories. Yes, cool looking shape will make a young teenager drool, and perhaps some of the more unique designs will catch attention of the critics but that isn’t as important to rest of the audience. 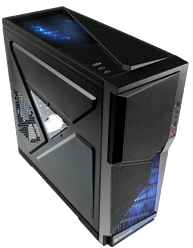 Thermaltake continually makes improvements on their cases and they put more thought in every new release. One of their latest is Armor A90. This is a more affordable of the Thermaltake cases. We’re going to take a look at overall look of the case, how much thought was put into the design, space management, cooling, noise level, and features. Let’s see what Armor A90 has to offer.